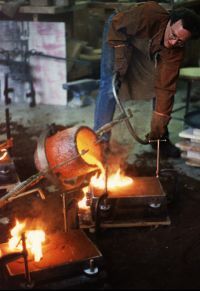 Royalston Arts Foundry was established in 1982. Our family operated foundry offers casting services to the artistic, commercial and industrial community. Originally intended as a supplier of precision lost wax castings our capabilities have expanded to large sand casting as well. We have grown from a small arts and crafts foundry to a multi crucible operation. Our rural New England setting enables us to take natural pride in each casting.